Our closest relatives are chimpanzees and bonobos, two iconic and charismatic species that are endangered by human activity. Just like many other primates, chimpanzees and bonobos are threatened on a daily basis by loss of habitat and the ape trade, in which they are kept as pets or sold in the illegal market for bushmeat. In order to proactively contribute to a better future for these endangered animals, we are researching the behavior of chimpanzees and bonobos in captivity and in the wild, as part of our research program Projet Grands Singes in Cameroon and LuiKotale in the Congo[M1] . With a local team, we are researching how apes and people can live together outside of preservation sites. Recently, we also researched the nocturnal behavior of chimpanzees. Knowledge about chimpanzees’ nocturnal behavior and sleeping patterns is, on the one hand, important for protecting these animals efficiently. On the other hand, that data also sheds new light on the evolution of our own sleeping habits and can provide us with new information – for example, in regards to sleeping problems in humans. 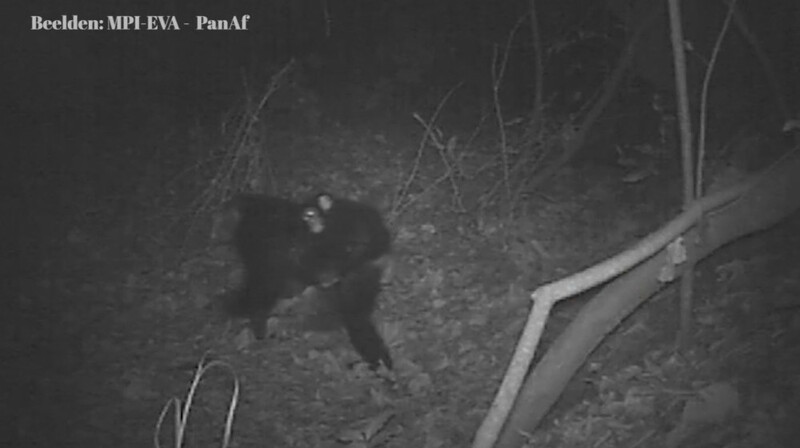 The research was conducted using video footage recorded by night-vision cameras at many different locations in Africa, as part of the PanAf program. That research program focuses on a comparative study of wild chimpanzees throughout the territories they inhabit. It was initiated by the Max Planck Institute for Evolutionary Anthropology in Leipzig, in collaboration with many other research partners. Under the leadership of Dr. Nikki Tagg and Dr. Barbara Fruth, two primatologists from ZOO Antwerp and ZOO Planckendael, the nocturnal footage was analyzed carefully, in order to get a better idea of chimpanzees’ sleeping habits. Using this detailed analysis of the videos, we researched, for example, which external factors can influence their sleeping patterns. This included such factors as the presence of other species (elephants, buffaloes) – and more specifically predators (lions, leopards, and hyenas) – nearby, the structure of the forest (how densely planted the forest is, how high the trees are), the importance of weather conditions (temperature, rain), and the role of all kinds of human activities (poaching and deforestation). What did the research reveal? This study taught us, among other things, that chimpanzees, just like human beings, have one, long period of sleep at night, from which they seldom wake. Chimpanzees seem to be able to adapt their sleeping pattern in response to changing environmental factors. Human activity plays an important role in these changes. The study shows, among other things, that it’s primarily the youngest animals that are active at night. Nocturnal activity seems to be related to high daytime temperatures, because chimpanzees are more active at night after a warm day. 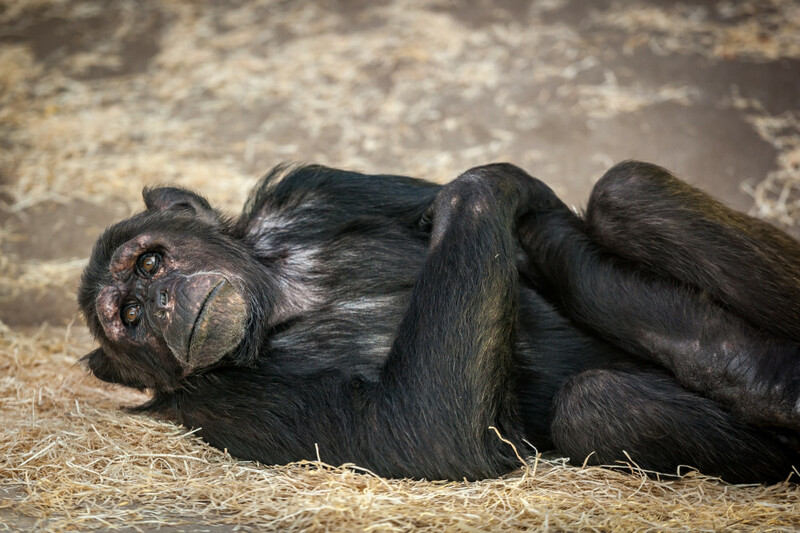 Chimpanzees probably have a harder time sleeping on warm nights, just like humans. The study also shows that nocturnal activity can increase when there is less disturbance due to human presence at night – for example, to hunt, illegally chop down trees, or gather other products from the forest. This information gives us better insight into the factors that may have played a role in the evolution of human sleeping patterns. Just like apes, our distant ancestors had to strike a balance between the costs and benefits of sleep versus waking. Sleep is crucial to restore all bodily functions, but sleep can also come at a significant cost. When you sleep, you are vulnerable to potential predators, and you have less time to gather food, engage in social interactions with fellow members of your species, or learn new skills. From an evolutionary standpoint, we assume that humans have developed relatively efficient sleeping habits compared to other primates because staying awake longer brought evolutionary advantages to early man. The longer waking period gave us more time to learn and create, and to better adapt to our surroundings. 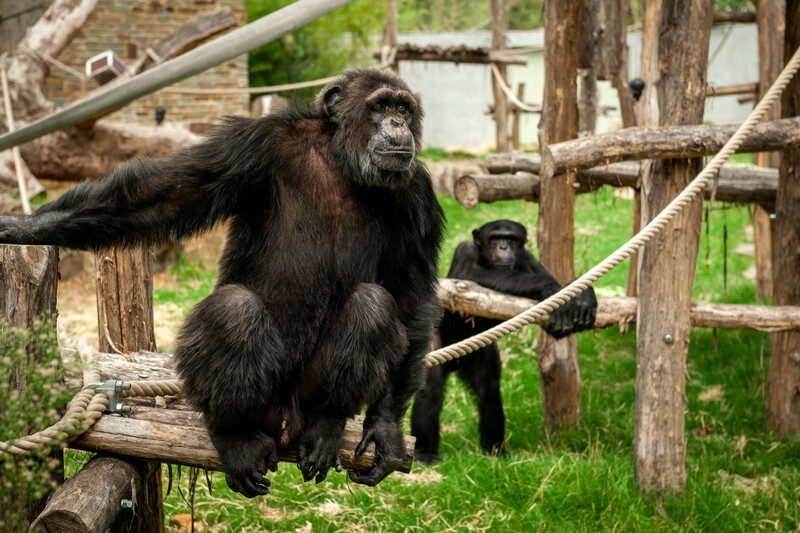 Our study shows that chimpanzees can adapt their sleeping habits in response to environmental stress, such as extreme temperatures and external threats. Similar factors have probably shaped the evolution of human sleeping patterns, when early man had to find a balance between the costs and benefits of sleep versus waking. There are indications that people in the pre-industrial West had two periods of sleep, with a wakeful period in the middle of the night. The hypothesis was that this was our forefathers’ sleeping pattern and that industrialization – and therefore a busier life – curtailed the amount of sleep we get. But our research suggests that our human ancestors had one, long period of sleep, just as we have today. 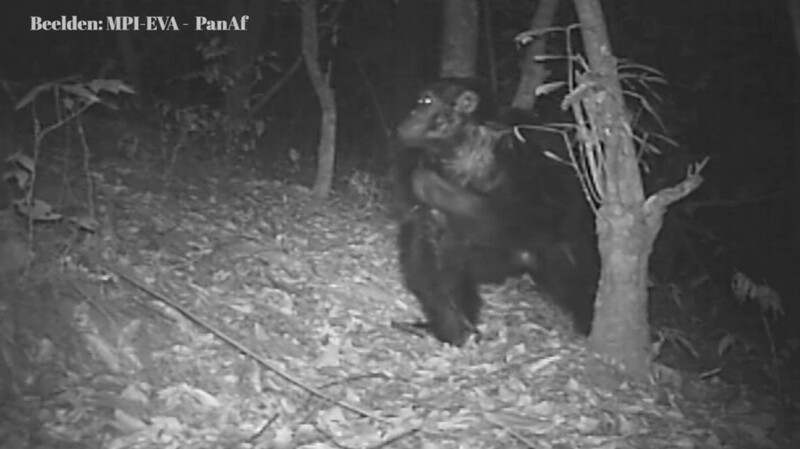 This is the first time that chimpanzees’ nocturnal activity has been researched so extensively. For decades, sounds and movement have been noted among primates at night. Never before has anyone looked into what role this plays in their sleeping patterns. Knowledge about chimpanzees’ sleeping patterns is important for the efficient protection of this endangered animal, but also gives insight into the evolution of our own sleeping habits. It could also yield information useful to, for example, sleep medicine. Therefore, we encourage scientists to consider elements from primate research in their research into human sleeping habits. By combining expertise, we can unravel the mysteries of sleep among primates and humans. The results of this study were published in a set of nine papers in the American Journal of Physical Anthropology. Tagg N, McCarthy M, Dieguez P, et al. Nocturnal activity in wild chimpanzees (Pan troglodytes): Evidence for flexible sleeping patterns and insights into human evolution. Am J Phys Anthropol. 2018;166:510–529. Fruth B, Tagg N, Stewart F. Sleep and nesting behavior in primates: A review. Am J Phys Anthropol. 2018;166:499–509.